In a standard economics framework, markets are seen as an efficient way of allocating resources. Consequently, the market price is used to signal the welfare effects. However, the market price may not reflect the ‘real’ value, due to market failures, resource scarcity or economic distortions. Saudi Arabia’s economy is subject to many such distortions, including energy price controls, and market prices for energy may not be a good measure of value. Calculating shadow prices of resources or opportunity costs captures this price-value divergence. The project is in collaboration with the Baker Institute for Public Policy at Rice University, Texas. •	How do distortions propagate through the economy? 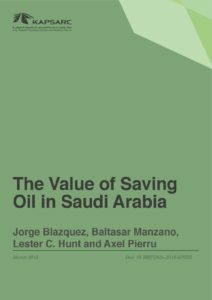 •	Does the standard approach of determining opportunity costs apply to Saudi Arabia? •	How can the opportunity costs be determined and projects assessed from a public perspective? •	What are the most important opportunity costs for the Kingdom and how can they be approximated?